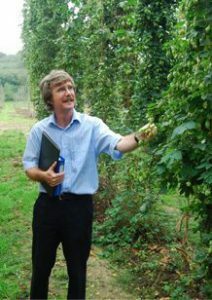 Dr Peter Darby is a hop researcher and the public figurehead behind Wye Hops Ltd. Established in March 2007, Wye Hops Ltd is a subsidiary of the British Hop Association and is the vital research centre for the British Hop industry. Funding for the project comes from the British Hop Association growers. Additional funding has been made available by IBD, SIBA, BBPA, East Malling Trust, Kent County Agricultural Society, Defra (the UK Government) and charitable trusts. Wye Hops Ltd. is located amongst the commercial hop gardens at China Farm, run by Hop Farmer and British Hop Association member, Tony Redsell OBE. This site was selected mainly due to wilt-free conditions and a possibility for irrigation. For news from Wye Hops, please click here. Endeavour (selection code 15/2). This variety is currently on farm trial and has had major success in brewing trials. Developing UK-Fuggle varieties with wilt and aphid resistance (on-going). Successful EU registration of two new hop varieties: Sovereign (granted EU plant variety rights in 2010) and Boadicea (granted rights in 2008) – the world’s first aphid resistant variety. Establishment of the national hop collection at Queens Court in Kent. This collection includes over 70 historic English hop varieties from Mathon (1737) through to Sovereign, including Early Bird (1887) and other Golding varieties. Rescuing the English hop breeding programme following the closure of the programme at Wye College in 2007. A hop breeding programme consists of preparing pollen, making controlled crosses, raising seedlings, transferring seedlings to the field, and collecting, drying and pressing cone samples from the seedlings for analysis. For historic reasons dating back to the early 1900s, in England male hop plants are grown alongside female hop plants. In the breeding programme, the males are not ‘killed’ but used as parents to develop new female varieties like First Gold. 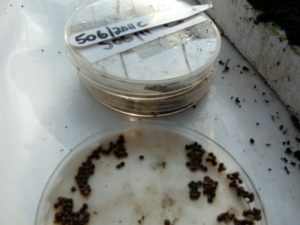 Peter uses the male hop plants mainly for their growth habit characteristics and to provide disease resistance in their female hop plant progeny. In 1962, hops in England were covering an area of approximately 8,200 ha. Since 1962, the area has declined and was stabilised to approximately 1,060 ha in 2007. This stability remains and since 2007 the UK crop has been about 1,000 ha. In March 2012, Wye Hops Ltd celebrated a very successful five year anniversary and has a bright future ahead. Peter Darby associates British flavour notes as being subtle and balanced. Although hoppiness is distinct, there are also fruity and woody notes present but without any one note being predominant. The effect is that you want to have another drink of the same beer; there is no need to change to another brand. Brewers around the world want “something new, something different and something not tried before” – with 31 commercially available varieties and more in the pipeline, it’s time to celebrate Great British Hops in your beers.